Beneficiation improves the economic value of minerals by removing waste or dirt, which results in a higher-grade product. Single-row cage mills’ controlled impact principle makes it especially valuable in the beneficiation of sand and gravel and in the crushing, upgrading, and liberation of all types of aggregates and ores. They produce cleanly broken, cubical particles with maximum gradation control for the full life of the wear parts. Six models are available with an approximate capacity of between 25 and 800 tn/hr. Maximum feed size for the small unit is 4 in., 12 in. for the largest. Capacities vary with speed, size of the desired product, and weight per cu ft of material being reduced. They don’t require screens for final product sizing and have an open discharge that won’t plug. 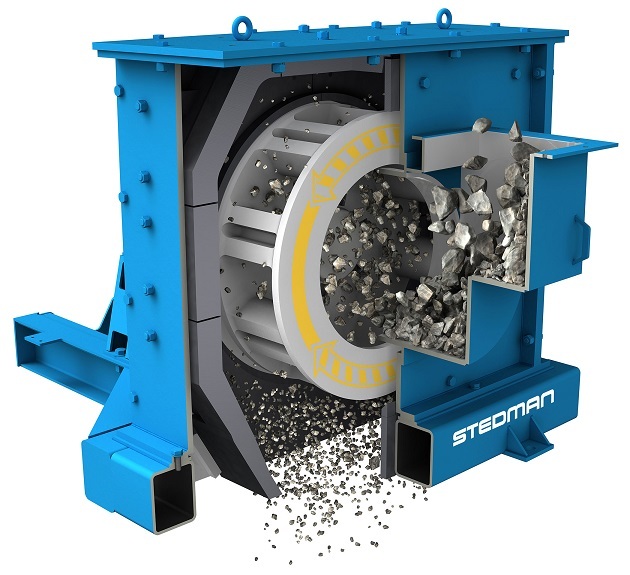 Stedman cage mills can be operated in reverse, in order to prolong the useful life of their cages and breaker plates. Maintenance and service are easily performed, and downtime is minimal. Removal of the housing permits easy access to the cage, which can be lifted out through the cover opening. Material fed into the hopper drops onto a bed of like material before falling into the cage, preventing undue wear on the hopper and prolonging the life of the unit. The hopper is hinged so that it can be swung open or even lifted off without being unbolted. Holes in the top flange allow a feeder assembly to be bolted onto the hopper. The material to be reduced is fed into a rapidly spinning cage of heavy alloy-steel bars. The bars strike the material and smash it into particles, hurling the particles against other bars, breaker plates and other particles. Each impact reduces the material further until it reaches the desired fineness. This fineness is determined by feed material, mill speed, cage design, auxiliary screen use, and test sample runs.